ISTANBUL (Reuters) - Turkey has reversed its decision to ban a German journalist from leaving the country while she awaits trial on charges of being a member of a terrorist organization, the journalist said on her Twitter account on Monday. 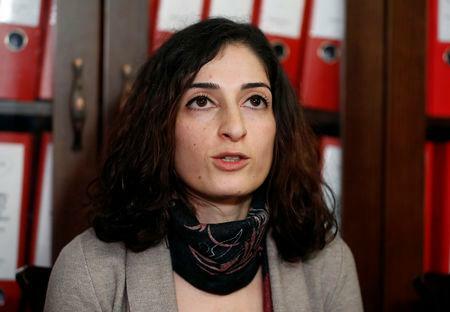 Mesale Tolu confirmed on her Twitter account German media reports that the travel ban Turkish authorities imposed since she was released from prison in December after eight months in detention had been suspended. "As a result of my lawyer's application, my ban on traveling abroad has been lifted," Tolu wrote on her Twitter account in Turkish. "My prosecution will continue on Oct. 16." Germany has demanded the release of several of its citizens, some of Turkish origin, as a necessary step to improve ties with Turkey. Relations between the NATO partners soured after Germany condemned Turkey's arrests after a failed 2016 coup of some 50,000 people, and the suspension or firing of 150,000 others, including teachers, judges and soldiers. Eight German citizens are being detained in Turkey on political grounds, including one arrested last week. Turkey has also arrested several U.S. citizens. Germany has urged Turkey to improve ties with the United States and Germany, which would ease an economic crisis sparked by a sharp fall in the lira.